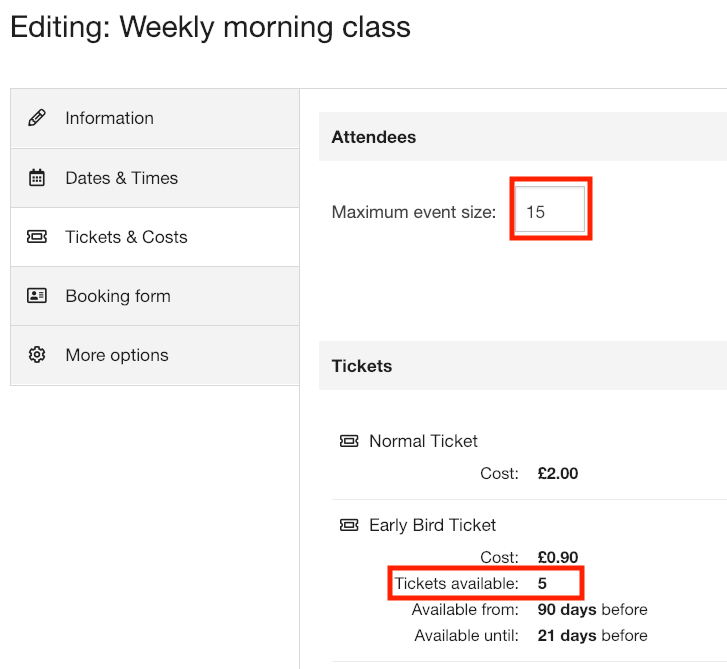 The total number of attendees allowed to book onto an event can be set under Maximum event size found in Tickets & Costs after clicking edit entry on an entry. Bookings will no longer be permitted when this many attendees have booked, and your event will be shown as 'Fully booked' on your public page. If you have a Waiting List then this will also be established. If you have a limited amount of specific tickets (e.g. 'early bird', trial and members tickets) then you might want to cap the allowance. In our example below we only have 5 early bird tickets for our 15 capacity event. Just click on the ticket in question to set.